This weekend I've felt the need for some 1980's NATO-Pact gaming. I turned to Flashpoint Campaigns: Red Storm, which is the current reigning champion for grand tactical simulation of this era. I really like the game engine in this sim, which features an innovative asymmetrical turn-based WEGO approach to simulate OODA loops. I haven't been playing it as much as I'd like, and I mean to remedy that. 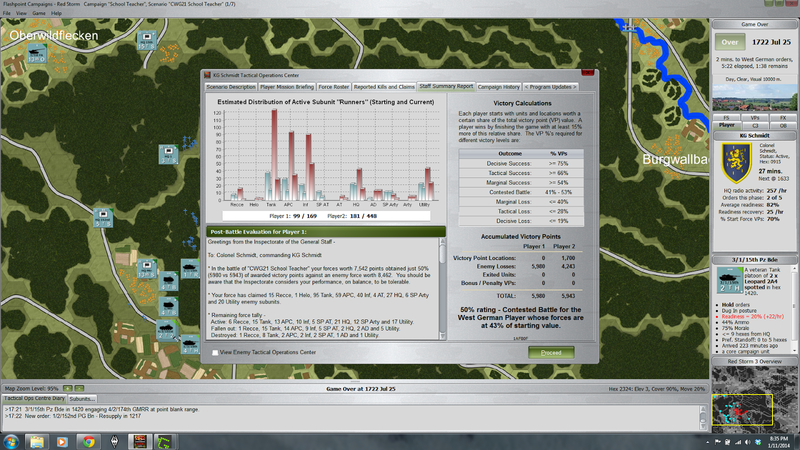 On Target Simulations have been great about issuing game updates, participating in forum discussions, and particularly in providing new scenario and campaign content. Around US Thanksgiving, they made available a new West German campaign called "School Teacher." 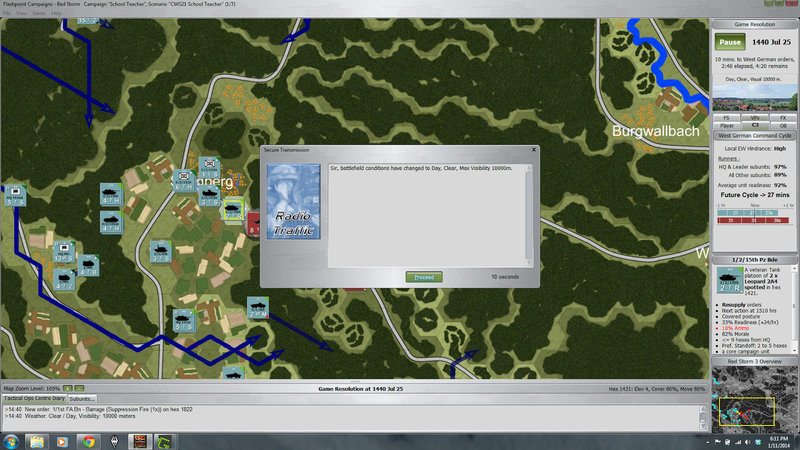 Here's my AAR of the first mission of the campaign. Our mission is to occupy and defend the village of Sandberg. 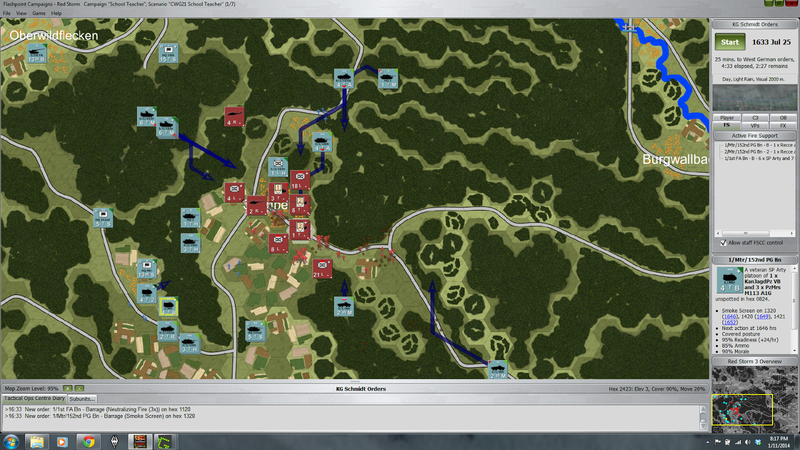 To do so, we are the 15th Panzer Brigade, made up primarily of 151 Panzer Battalion and 152 Panzergrenadier Battalion with attached brigade recon, AD, and artillery assets. Initially we have a company of 151 Panzer, a company of 151 Panzergrenadier and the brigade wheeled recon company available. 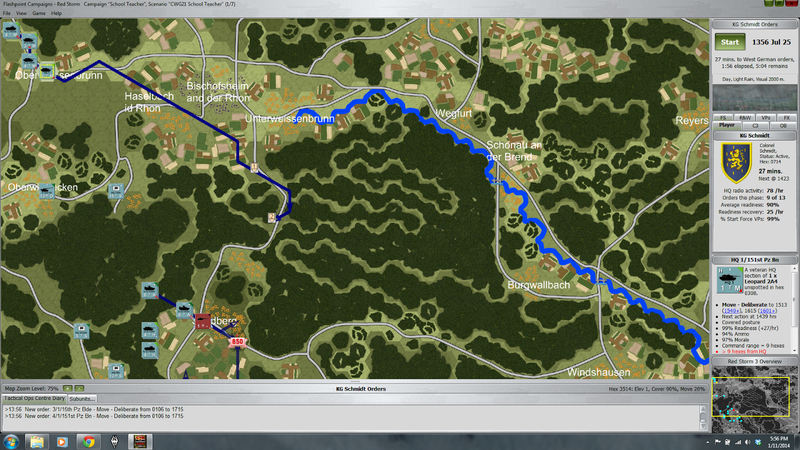 Initially I'm going to move 2/151 Panzer into overwatch positions west and south of Sandberg while the recon units move through the town and take up positions to get a view of the road to the east. 2/152 will move into position in the woods west of the village and prepare to occupy it once the recon troops have indicated that its clear of enemy. The weather is clear and dry. 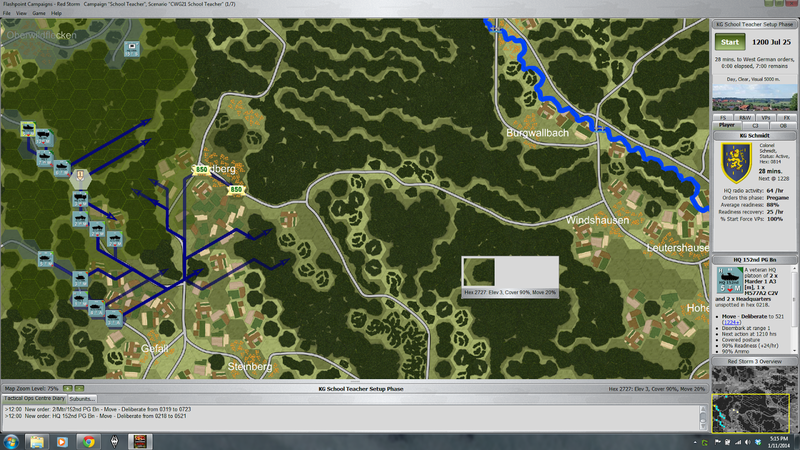 The recon sections move through the town and take up positions to overwatch the road. At the east exit to the town one of our recon sections encounters a WP recon unit. The Fuchs armored cars of the recon section are no match for the BMPs of the WP recon unit. 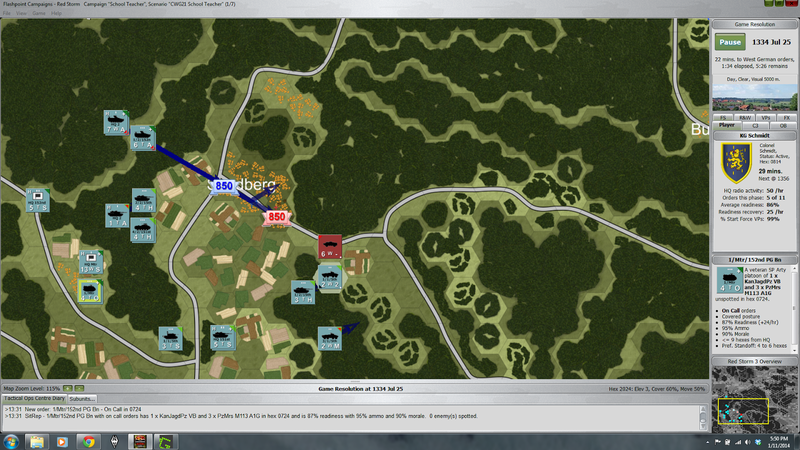 The Leopard 2A4s of 2/151 take quick revenge though, destroying the enemy through direct fire. The men of 2/152 mount up and prepare to defend the village itself. 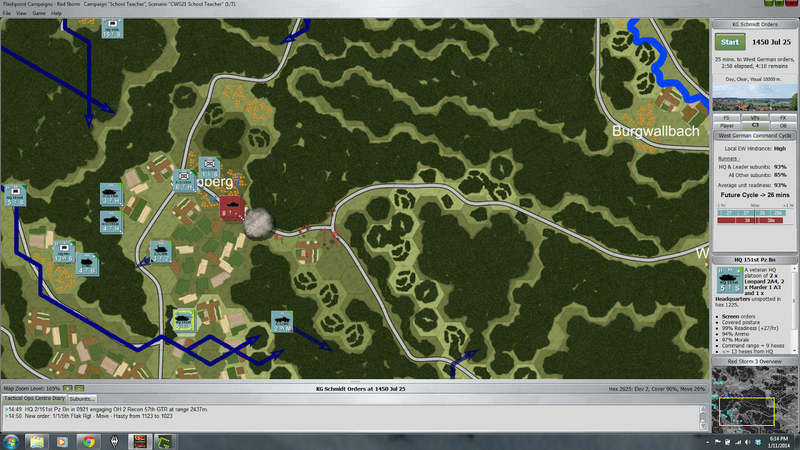 As the infantry moves in, a WP recon helicopter passes over the village, scouting. Some light rain has started, closing visibility down to 2000m. This will be helpful to us with our thermal imagers, and a detriment to the advancing WP forces. Along with our attached artillery, 1/151 has arrived. I order them to move north of the village so I can move them eventually into a Support by Fire position similar to the one occupied by 2/151. Pact armor begins to arrive east of the village. 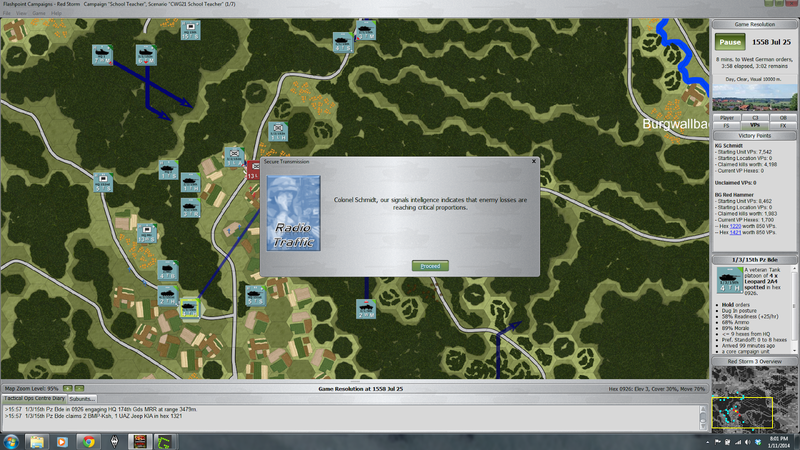 I fire some smoke to further blind the attackers and move 3/2/151 into the eastern edge of the village to help with the defense. Infantry, armor and artillery fire begin taking a toll on the advancing WP armor. I've ordered my AD platoon to a position where they can threaten the Pact helos, keeping them blind and away from my vulnerable armor in case they're directing in attack helicopters. Unfortunately the rain lets up. I'll have to depend on smoke alone. 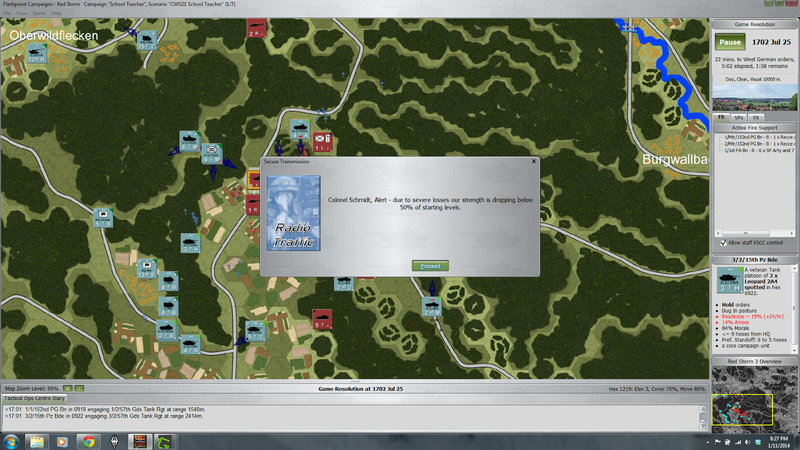 The weight of the Pact armor is simply too great and 3/2/151, along with several infantry squads and Marders are destroyed. The remaining platoons of 2/152 fall back to the west side of the village as 2/151's Leopards pound the advancing WP forces. A second company from 152 Panzergrenadiers has arrived. 2/151 bleeds the enemy as they advance to take the rest of the village, but it isn't enough to stop them from pushing my infantry out. My recon units are out of place and scramble to get into a position where they can spot east of the village and call down artillery on what looks to be a Pact Motor Rifle Regiment. 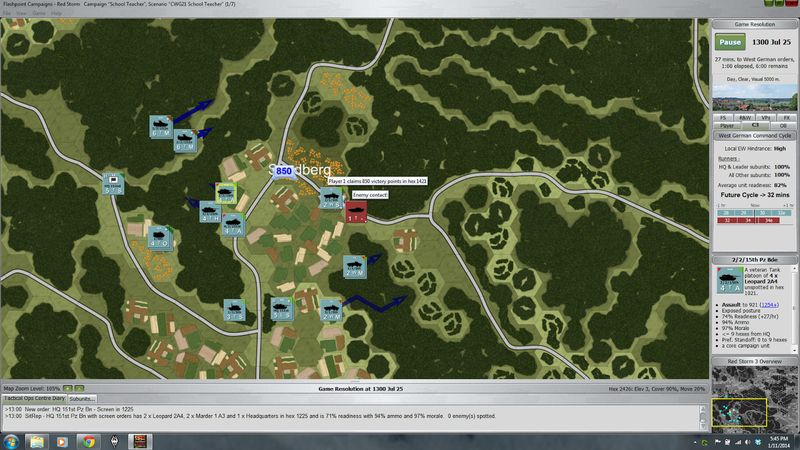 3/151 has finally arrived and is moving to take up positions south of the village to stop the Pact infantry attack. Both 1/151 and 1/152 are slow to get into position. Unfortunately, I wasn't quick enough in pulling my Gepard platoon back and it was completely destroyed by the enemy T-64s. This leaves me with no AD outside of vehicle mounted machine guns. 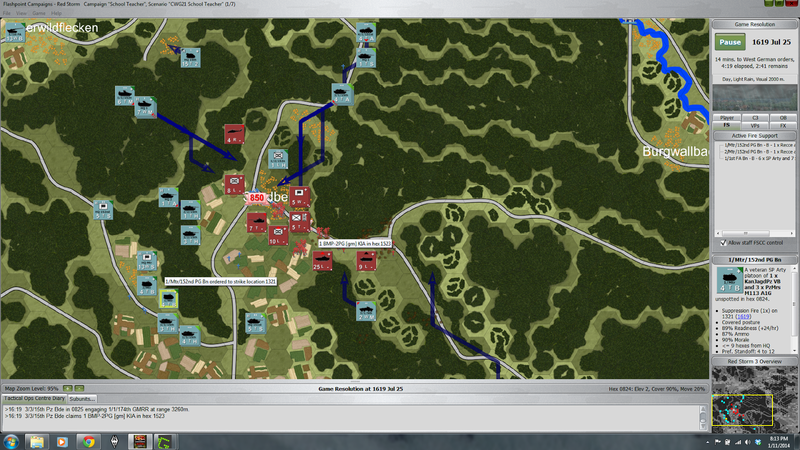 The combined fire of two companies of 151 Panzer, mortars, and the brigade artillery are taking their toll on the enemy. The village and ground around it are littered with the burning hulks of Pact vehicles. 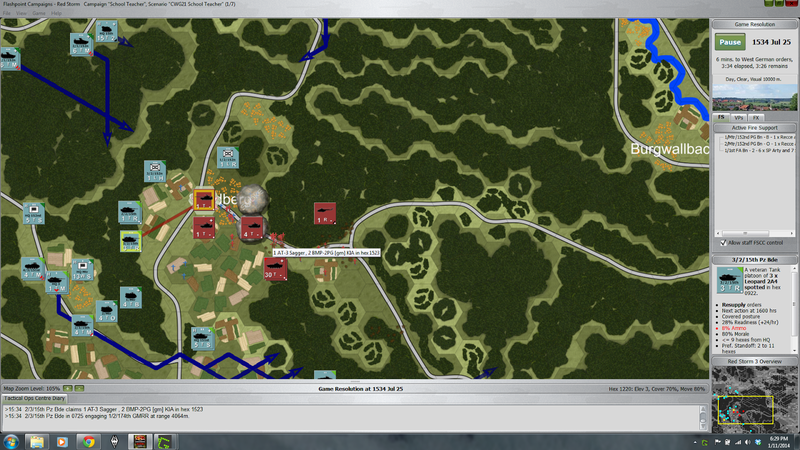 A flight of Mi-24 attack helicopters show up to support the Pact advance as the enemy infantry moves into the village. I have no way to stop them. 1/151 is ordered to assault from the north. The Hinds wreck two entire platoons of 1/151 before they can fire a shot. 2/151 is down to the HQ tank and a single platoon. 2/152 can muster a single squad. I fire some smoke from one of my mortar platoons to mask the movement of the remaining platoon of 1/151, but I have the distinct feeling that I'm not taking Sandberg back. Our recon sections finally get into a position to get a view of the rest of the Pact forces. 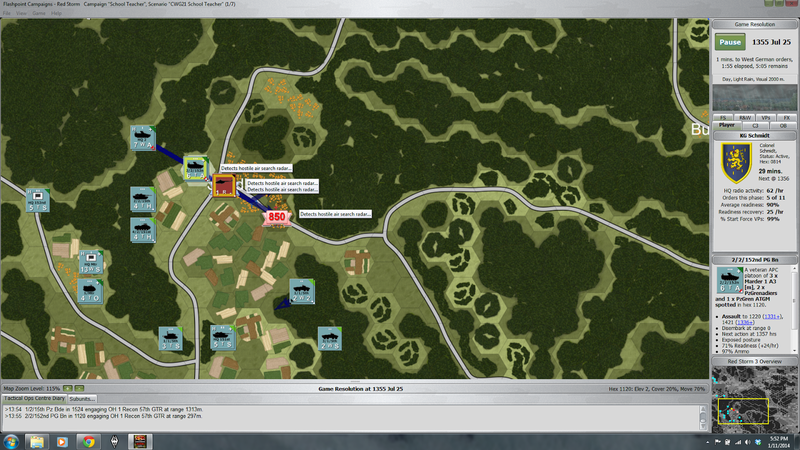 We're taking serious losses now among the Leopards and Marders trying to assault the village. We've taken out some of the Hinds but the Pact attack helicopters were the key element in facilitating the enemy's successful consolidation on the objective. Our attack on the village has been costly, mostly due to poor assault planning during a meeting engagement and a lack of effective air defense. I really didn't expect the late arrival on those Mi-24s and I should have. There is no question that we don't have the combat power to retake Sandberg now. Twenty minutes later the Pact attack stalls and it's all over. We've stopped the advance but do not hold the village. We've also take some serious casualties in doing it. The aftermath: a contested battle, just shy of a marginal success, with 43% of my force intact. Better than I expected, actually. I found this battle to be more of a challenge than the original scenarios that shipped with the game. This was not your typical "NATO defends from prepared positions" initial day of the war scenario, but rather the sort of meeting engagement that might have happened as NATO units moving to those defensive positions encountered advancing Pact formations. After playing a lot of WWII games the past month or so, I'd really forgotten how much longer the engagement ranges are in modern war, and how much faster modern mechanized forces move. Finally, attack helicopters are an incredible threat. Good AD is essential. Great post Doug. 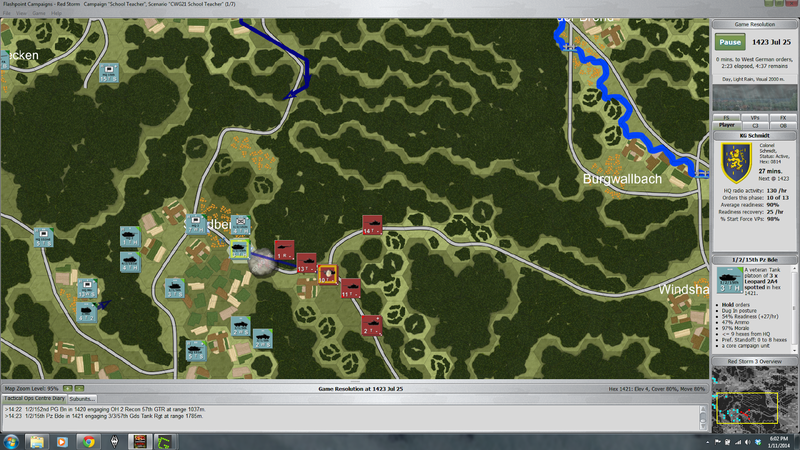 I have the original game Flashpoint Germany and am presently working through that when I can make the time. I really wanted to pick up the new game after having gotten in on the beta test, but was a bit put off that it was not included in the Matrix Holiday Sale. Hopefully it will be next year, or featured on a Deal of the Week (which is how I got the original game). I have FPG as well, and enjoyed it. Matrix looks to have kept both this and Command out of the sale which is a shame, since both are games of the caliber of Command Ops, IMO. Hopefully we'll see them in sales or at reduced prices this year. Nice AAR Doug. Fog of War in this game is unbelievable. I played part of the TF Rhino scenario last evening. I had 500m visibility with heavy rain and mist on the battlefield. My recon units were forward but despite that I had T-72s popping out of thin air so to speak right in front of my line formations. Glad you're enjoying it Chris! It really is brutal some times. Usually the thermal imaging systems in NATO vehicles will let you keep the range open, though not always. If the WP units get in close, it's going to hurt! Great AAR Doug. I never bothered to check the mods and scenarios section of this game in Matrix forums. Looks like I miss lots of great stuff. Thanks Fatih! I think we're about to see a bunch more modding after 2.03 and the modding guide come out this month.